Cliffjumper has more fight in him than any other three Autobots combined. Brash, bold, and aggressive, he ignores his small size and weak armor in favor of just charging in and hoping for the best. No other Autobot has won so many fights through sheer attitude alone. Cliffjumper is a recurring character in the Transformers universe, starting way back in the wee days of Generation 1. To my knowledge, Cliffy was there from the very get-go of the G1 cartoon, and was one of the Autobots brought back to life on the Ark. It was very clear that after being awakened, Cliffjumper wanted some action and took to randomly shooting at Decepticons shortly after reactivation. And that’s half the fun of Cliffjumper; running headfirst into battle without much thought and trying like hell to fight any ‘Con he comes across, no matter how undersized he may be. In a particularly great episode that shows this, “Transport to Oblivion”, Cliffjumper confronts Megatron by himself, gets man-handled, and shortly thereafter goes after Starscream. What’s not to love about this character? Anyways, this brash (suicidal?) shade of Cliffy’s character is what makes him lovable. In my opinion, he gets bonus character points for being interesting and hilarious at the same time. 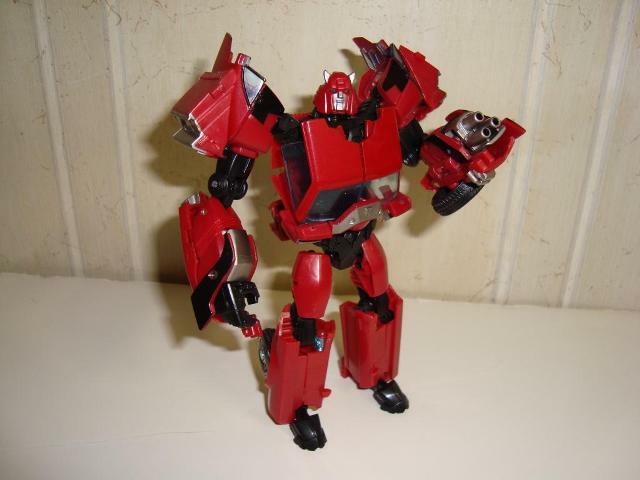 As for Cliffjumper toys… well not so much originality going on there. 99.9% of the time Cliffjumper is a Bumblebee redeco. The only ones that I can remember that aren’t straight redecos are the G1 toy itself, and any one of the new Prime toys (this version included). Sometimes you’re lucky even if he gets a new head. This is the primary reason I picked up this version of Cliffjumper. As a self-proclaimed Classics lover, I originally had Classics Cliffy. Which is a straight Bumblebee paint-over. Not even a new head. I was intrigued by a mold that I didn’t already have, wasn’t a straight-up red Bumblebee, and had a head and body design that would fit in with my Classics collection. For many, that may well be the reason why this toy is purchased. Cliffjumper’s alternate mode is a rarity amongst Classics-styled Autobot cars. Most of the other characters transform into some sort of sleek, high-powered sports car. This version of Cliffy, however, is a muscle car. In my opinion, Autobots could use a couple more muscle cars; they just have a great look that can’t be beat. 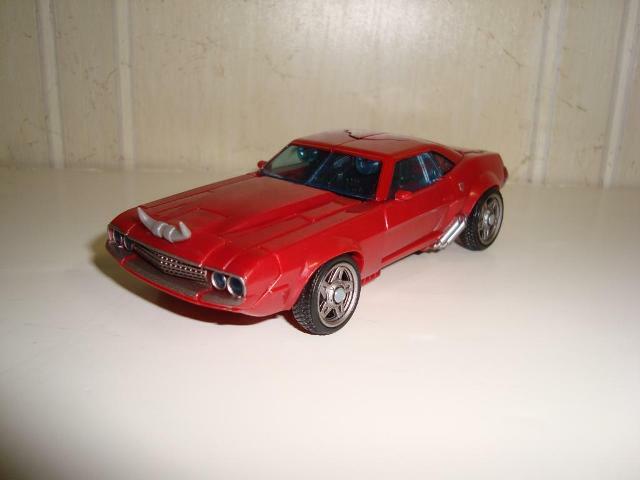 Specifically, this alternate mode is a mix of a Plymouth Barracuda and a Dodge Challenger. The main color is a dark metallic red with some minor silver details on the side exhaust pipes, rear bumper, and front grill (which is also antiqued a bit for some depth; a nice touch). You’ll find the tiniest silver Autobot you’ve ever seen on the driver side rear fender. Sadly, there is a spot for another symbol on the passenger side rear fender, but this one is unpainted. Maybe it’s just the one I have, but it’s still a disappointment. The wheel rims are silver too, and the back tires are slightly larger than the fronts, adding to the classic muscle car feel. The windows are translucent blue, and to finish of the design there’s a set of bull horns on the hood. It’s a nice little nod to Cliffjumper’s characteristic horns in robot mode, and gives the alt mode a bit of originality over the traditional ‘here’s a car and that’s it’ design you typically get. The wheels on my Cliffy roll just fine, and the car moves well even over carpeting. The car mode is quite solid once all the tabs are in place, and nothing is loose or wobbly. Size-wise, he fits right in to the deluxe price point Classics cars. Overall, the alternate mode is a fresh change from high-end sports cars, and the detailing is simple but nice too. The transformation to get to robot mode from alt mode is somewhat simple, but there are a few bits that cause frustration. At times the panels and tabs seem a bit tight, and I feel like I’m going to snap it at any moment. It’s not a cheap plastic thing; more or less they’re quite snug and my hands are strong. With a little care everything moves in and out well. There are a couple fidgety little things that slide here or there, like the tiny window sections on the legs that fold in, or the front end tabs that swivel under the grill. They’re not a huge obstacle, but if you forget to fold them at the right time, the transformation needs to go back a few steps. Once everything is all in place, all parts seem quite secure, and there aren’t any parts on mine that fall out easily (like RTS Perceptor’s backpack). One issue with the figure I have is the small platform the head rests on. The pin joint is incredible tight, and Cliffy’s head pops off of its ball joint quite a bit when moving it to and fro. I don’t know if it’s a widespread problem, but I’d hate for the head joint to eventually break due to the friction. In robot mode, Cliffjumper’s color palette is what you would expect. Dark metallic red, black secondary color, and a few silver highlights. I think the new head mold is great, and represents G1 Cliffy very well. I half-expected HasTak to give him a little smirk instead of the stoic expression he has, but it’ll do. The head is made of red plastic, the face is painted silver, and the eyes are made of blue light piping that works really well. Proportionally, Cliffjumper is a bit off for a Classics design (yes, I know it’s a Prime design) so that may put some people off from using him in your Classics/Universe/Generations collection. Proportion issues only revolve around his enormous shoulders, almost like he’s an American football player. Other than that, the ‘bot itself looks fine. Articulation is decent, with knee, hip, and ankle joints for good positioning. On the arms, Cliffjumper has shoulder ball joints, swivel upper arm joints, and bending elbows. The wrists swivel too, but the forearm ‘armor’ hinders the motion down to about a 90� swivel. I wish the arms had a bit more motion to them, but at least they’re serviceable. Any awkward positioning becomes apparent only when his guns are flipped out, and to me it seems like they’re not tilted the way they should be for natural firing. Yes, I said it, flip out guns. On both hands! If you want Cliffy to be a weapon station, you’ve got it right in his arms. Move the wheel panel, flip ‘em out, and you’ve got six cannons worth of ‘Con blasting goodness!!! In my opinion this is a great upgrade from the weaponless Classics version (a jet-backpack? Really?) without having to go to extraordinary lengths and expenses to put a gun in his hand. Does it fit in with traditional Classics figures? Maybe not, but it’s not too far from the gun/blade weapon that came with Universe Ironhide and Ratchet. Overall I think Cliffjumper is a solid toy. Is he a must have? Not at all. He falls right into the personal preference category like Generations Springer does, since he doesn’t quite fit into any design continuity exceptionally well. I like him, and the variety you get from this version over the Classics Red Bumblebee is worth it. Being a store exclusive makes him a pain to find, but if you do come across him, he’s worth considering. Transformation Design: 6. Simple, but some tabs are frustrating. Many times I will cobble the car mode together and just push from all angles to get it all to snap into place. Durability: 7. The plastic seems sturdy but a little bit of a quality downgrade from figures made a couple years back. I worry that tabs may snap from repeated transformations. Fun: 8. Pretty poseable with big feet and articulation, and both hand have flip out guns. Random, non-premeditated gun fire is imminent! Aesthetics: 7. The dark metallic red is nice, and the silver paint detail is great. The car mode is a little bland. I like the whole design, but some may just think it looks exactly like a Classics head on a Prime body. Articulation: 6. He’s got articulation, but I think an extra arm joint may have helped. The shoulder joints seem very tight. Wrist movement is a quite limited. Value/Price: 5. At the current price for deluxe class, he isn’t bad. He doesn’t do much other than replace a Classics Cliffy or give you a new Cliffy if you didn’t have one. Overall: 7. This one will all come down to personal preference. I like the variety he gives to a Classics collection as a whole, but on his own merits he’s just average. You shouldn’t go stalking this figure day and night, but if you come across him, he’s definitely worth some consideration.